Setting aside the questionable journalistic judgment of agreeing to an interview with Mayor Rahm Emanuel that excludes rampant gang violence, school closings, union busting, the budget crisis, and two dozen other urgent issues—“It was a conversation the mayor agreed to have as long as music was all we talked about, which was fine by me,” author Mark Konkol writes—DNAinfo’s musical mayoral chat on Tuesday is a pathetic epic of puffery and missed opportunities. The closest Konkol gets to any musical information Chicagoans might actually care about is noting that “earlier Monday [Emanuel] had just had a discussion about his master plan to turn Uptown into a music venue mecca.” But that’s all we learn. What exactly are those plans? When will they be put into action? And who the heck will pay for them? Those are questions Emanuel doesn’t answer, as I have noted before. But this time, he wasn’t even asked. 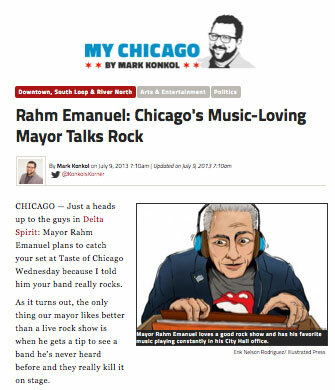 We are, however, told that “Chicago’s music-loving mayor” cites Gold as his favorite Ryan Adams album; that he has never moshed; that he skipped seeing the Rolling Stones at Soldier Field because they could never top their 2002 show at the Aragon (with that I agree); that My Morning Jacket is his “new discovery”; that he plans to see fun. at Taste of Chicago, and that his roster of other recent live shows includes Mumford and Sons, David Gray, Ray LaMontagne, and Buddy Guy. Konkol, whose “My Chicago” blog is devoted to tales “about real Chicago… beyond Second City clichés,” also gives us a lot of palaver about how much he loves the thoroughly mediocre, California-to-Brooklyn transplants in Delta Spirit. He advocates that the mayor absolutely not miss the group opening for fun., and actually believes Emanuel when the mayor says that he’ll take that advice. Again, the “real Chicago” has a lot of pressing concerns, and even Konkol grants that the mayor addresses them only in empty sound bites: “Ask Rahm about violence or school closings, the guy’s a broken record, anyway.” But beyond that, it’s not as if there aren’t very real issues about music that any journalist granted time with the mayor on that subject is remiss in not probing. The alleged Uptown Music District: When are you going to stop talking about it and start doing something? Do you have any comment about the non-competitive deal for the Northerly Island concert venue that the Chicago Park District gave to Live Nation—the company that includes on its board of directors mayoral brother Ari Emanuel? Why did it take the city so long to act on the Congress Theater, given the long list of “dangerous and hazardous” conditions there? What’s the deal with this alleged mayor’s music office? Why is the Department of Cultural Affairs and Special Events still in the concert business, given the epic annual losses at Taste of Chicago and Millennium Park? Why did the city botch the opportunity to quash the radius clauses and otherwise level the playing field between Lollapalooza and local music promoters and venues when negotiating the never-ending deal for the mega-concert in Grant Park? And, similar to the issue with Ari and Northerly Island mentioned earlier, why did you break the promise you made during the campaign to ask for an independent negotiator to oversee any dealings with Live Nation and Lollapalooza (which Ari’s Hollywood talent agency co-owns)? Those questions would have been a good start to really examining the mayor’s relationship with music and the community here devoted to it. Sadly, Konkol thought it was more important to talk about Ryan Adams.